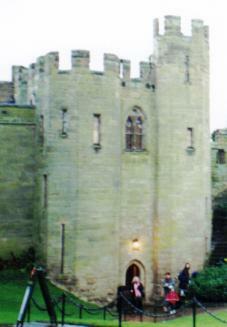 This is the gatehouse to the Inner Bailey. This is a picture taken from the highest tower at 147ft, I actually ran up it, nearly killed myself in the process and ended up finding out that I was going the wrong way up and met a disgruntled band of tourists three quarters the way up. 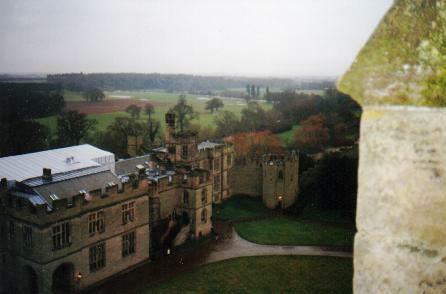 In this photo you can see much of the Inner Bailey (the grounds), the quarters (building to left of photo) and the Ghost Tower (in the far corner). 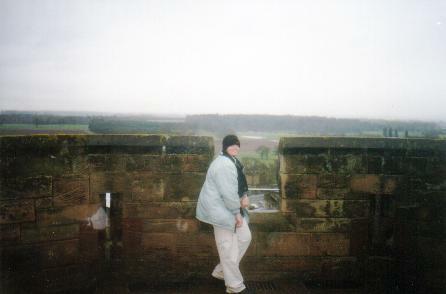 Another shot from the tallest of the two towers, though it barely can be seen the town of Warwick lies behind me. 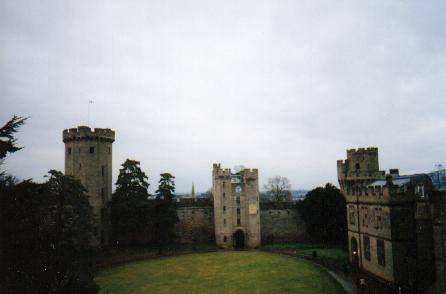 This bad shot was taken of the outside castle grounds, with mazes (background) and in the foreground is another smaller tower situated on a motte. 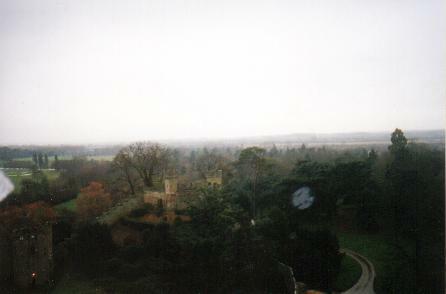 This was the view from next to the ghost tower, here we can see the tower where the above photo's were taken (to the left), the gatehouse with ajoining barbican (in the middle, barbican cannot be seen) and the other tower to the right. 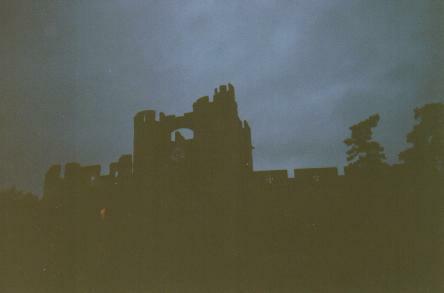 This was taken by night from the barbican and gives a good frontal view of the gatehouse and surrounding battlements. I Had time to sneak in a quick Castlegasm before leaving and here is me afterwards in a "smoking cigarette position" after a good castlegasm - though id like to point out that I do not smoke - and that that Smoking May Cause Lung Disease - so don't do it! 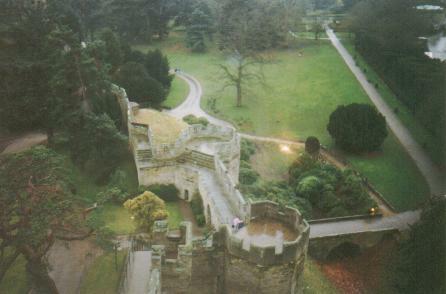 Warwick Castle, located on the River Avon, was erected in 1068 by William of Normandy. This castle was a literal impenatreble fortress - the way William wanted it to be. 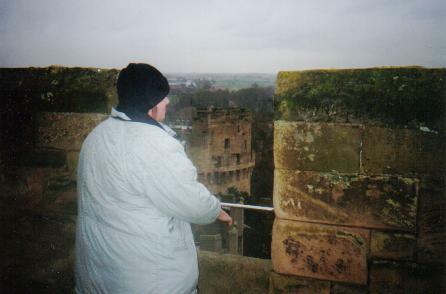 For centuries after this the castle was the home of the mighty Earls of Warwick - key figures in the War of the Roses and the 100 Years War with France. Later it played a vital role in the English Civil War as a powerful stronghold. As castles declined in importance the castle was lavishly furninshed together with a huge armoury. 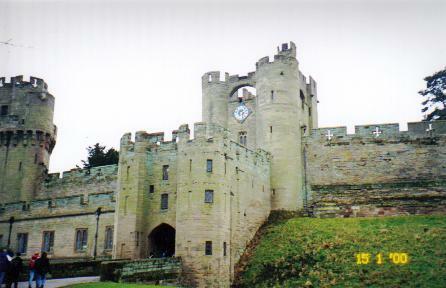 Castles were an important part of life during medieval times. The craftmanship of such fortresses was a skill in itself having to take in many tactical and strategical factors. 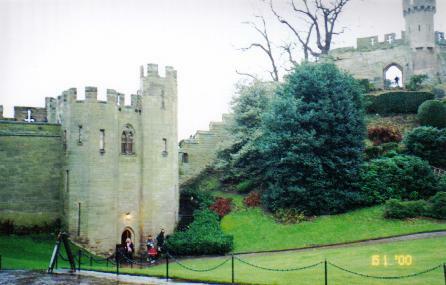 The early examples of a castle was known as the "Motte and Bailey" - the motte being Norman for turf which encorporated into a hill, and Bailey the fence around the outside and the area within. Later the traditional square stone castles came about. 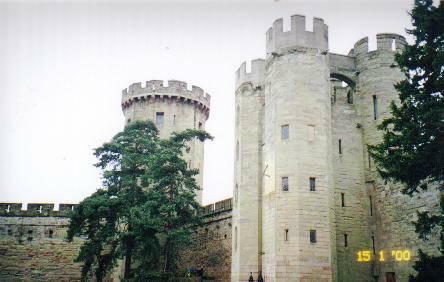 The basic parts of a castle are the keep, which is the large structure holding the leadership of the castle, the battlements - the squaring on the walls of the castles, the gatehouse and portcullis - the entry to the castle usually heavily fortified and the barbican which is a second gatehouse on the outside of the moat. This is a castle in a nutshell.